Hey there, blog friends!! Welcome to the second day of the Lil' Inker Design January release. Before I get to it...today is my birthday!!! 35 years ago I made my appearance into this world...it's crazy to think that I've been alive that long. Time certainly flies. Today I've focused on the more cutesie items in this month's release, and have created two final cards to share with you. 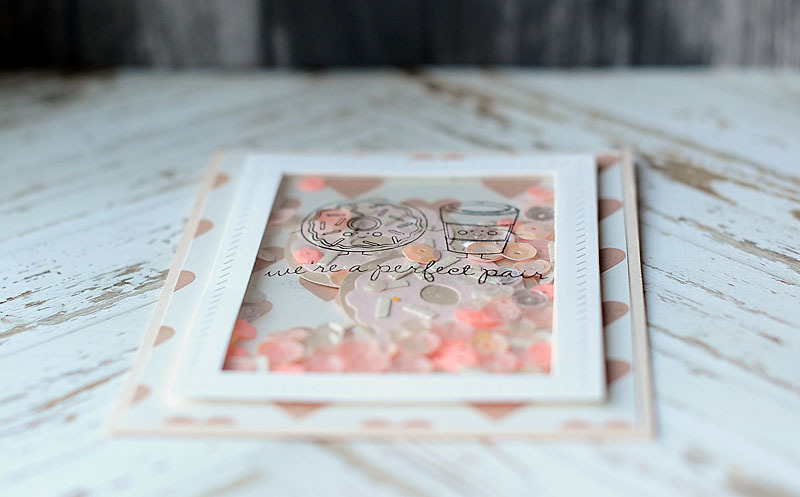 My first one is a shaker card full of pink, sequins & donuts...who could resist?! I love how the sequins look like they could be sprinkles that top a donut...plus I diecut a bunch of actual sprinkles from the Donut die by Lil' Inker Designs as well!! 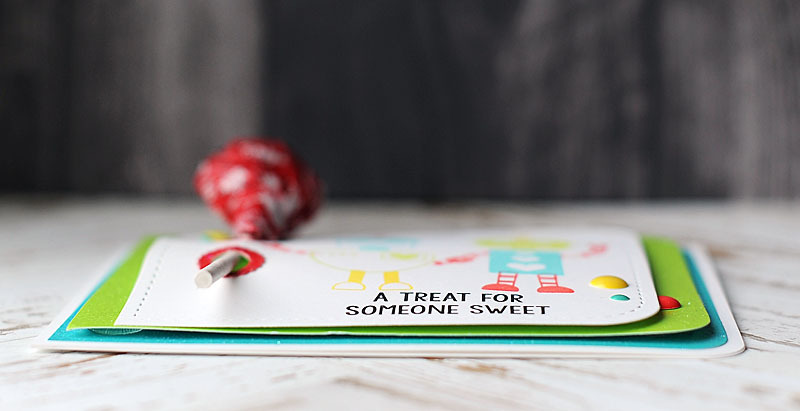 For my next card I created a card with the lollipop holder & the adorable robot stamp set. The glitter paper is not linked above. I've had it FOREVER, and couldn't find anywhere that carried it any longer. But just in case you want to know...it is Doodlebug Designs sugar coated cardstock in Swimming Pool, Limeade & Ladybug. Those are all of my creations for the January release from Lil' Inker Designs! Be sure to like my Lea Lawson Creates Facebook page to easily keep up with my crafty creation, & become a follower of my blog in the right sidebar. :) Have a wonderful Wednesday! Great cards! The first one the shaker is my favorite!!!! Awesome shaker card and a darling lollipop card too! Hope you have a great day and get to celebrate all week long!!! 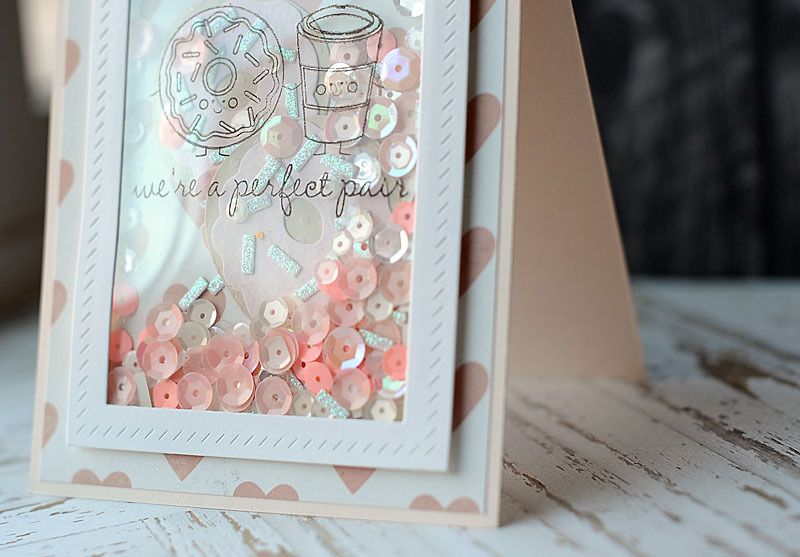 LOVE your shaker card, a DELIGHTFUL combination of FUN stamping with ELEGANT side stitching & sequins - WOW!!! 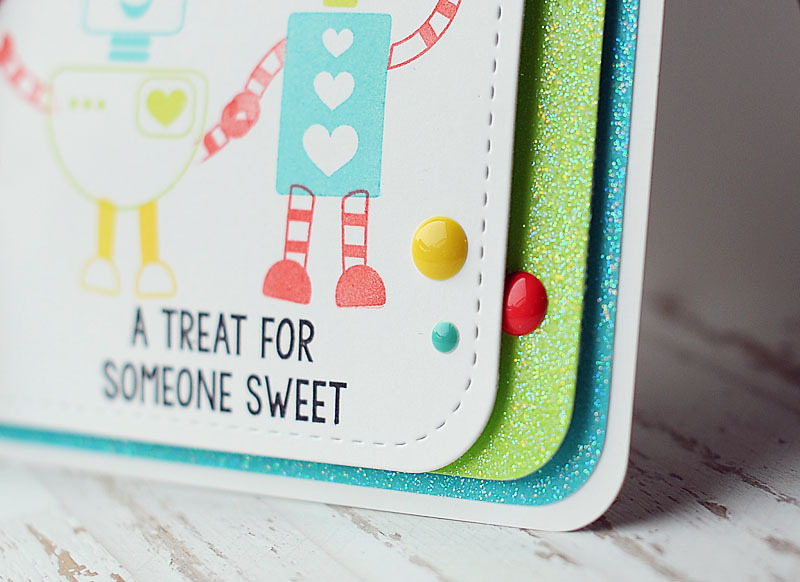 LOVE how you used the treat holder on your card too - it is SO CUTE with the BRIGHT & CHEERY robots & sparkly layers!!! THANK YOU for sharing your CREATIVE INSPIRATION on your special day!!! super sweet, I especially love your shaker card! Oh my goodness!!!! Such sweet and adorable cards!!!! Love the colors in the shaker card!! Those sequins and sprinkles in the shaker are sooooo sweet!! And I love that lollipop holder!! Those robots ROCK!! Happy late birthday!!!! I hope you had an incredible and special day! Love the shaker card! So adorable! Love both of these projects! What a super fun shaker card! And I LOVE that new treat holder die set!!! Awesome cards...love the shaker card with the soft colours. Love the layering on the monster card. the colors are so pretty. Wow, your designs are awesome! The shaker card is fabulous! I hope you have a wonderful birthday! these are sooo great!!!! but you already know I'm a big fan! LOVE that shaker card - that side stitched rectangle is such an awesome detail. Lollipop holder robots in those neon colors are super cute too. Happy Birthday and love your creations. Well first, let me say Happy Birthday....enjoy this age, I think it is the most perfect one!! I LOVE your shaker card...everything about it, the design, the colors...swoon...love it. All your projects are gorgeous and creative!! Happiest Belated Birthday! LOVE your shaker card ... just beautiful! And the treat card is adorable! Thanks for the fun hop! The pale pink and white are so soft. Thank you for sharing this lovely art with us at Word Art Wednesday. Love all the detail in your shaker and the glitter background is just right for the robots. Fabulous shaker card and I love your robot card. Great idea to place a lolly on the front !